Coffee Talk is a game about listening to people's problems and help them by serving a warm drink out of the ingredients you have. It is a game that tries to depict our lives as humanly as possible, while having a cast that is more than just humans. 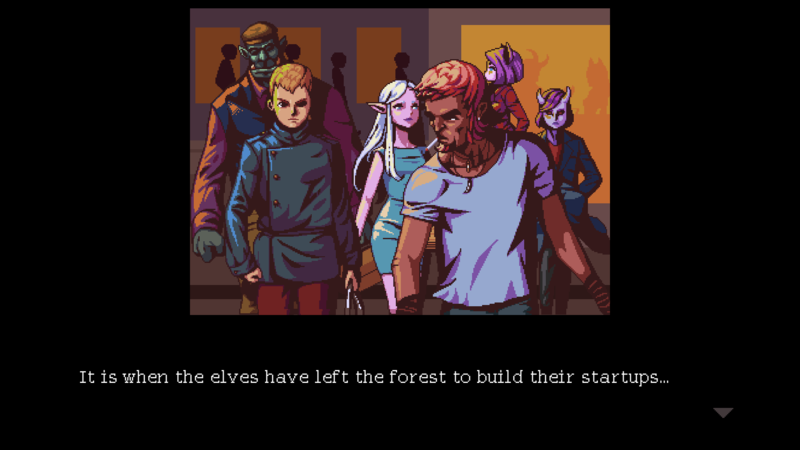 Immerse yourself in the stories of alternative Seattle inhabitans, from the dramatic love story between an elf and a succubus, an alien journey trying to understand human's life, and many other stories that we might be able to relate a lot. Coffee Talk was previously part of internal game jam held by Toge Productions under the title Project Green Tea Latte. You can try the game jam version here. I AM SO EXCITED FOR THIS GAME TO BE OUT. Have been waiting since its demo release and I can't wait! Is there at least an email list so we can get alerted for its release? Rooting for you guys on the sidelines! Been following the dev updates since mid last year when i first played it. SUPER excited as well. Agreed that an email list would be a cool idea. Honestly, this game has the "top ten best storyline" feel and I can't wait for this game to release! I played it all the way through and loved every bit. Awesome game, no other coffee game can relate. I really enjoyed this one. It's rare that I play through a game like this more than once, but I find myself coming back to Coffee Talk. I can't put my finger on what it is, but there is something about the aesthetics and ease of gameplay that appeals to me. Best the rest of the way! Did a little video on this, I really enjoyed it! It has amazing graphics and could really calm someone down. i really, really enjoyed this!! the style is perfect, the music suits the atmosphere, everything flows, and it's just fun and well-written. i'm so, so excited to play more of this!!!!!!! This is exactly the kind of game people need to unwind after a long day. It's chilled out, laid-back, relaxing and at the same time oddly gripping. Even though we only get to see two stories in this demo, they both really piqued my interest and now I simply HAVE to know what happens to everyone! The mixture of interactive story and hot drink brewing is definitely unique, and having to make sure you throw the right ingredients together whilst awaiting more personal tales from your customers is a real delight! The character design and subtle animations are beautiful, and the smooth music floating around softly in the background add to the atmosphere wonderfully. What Genre of music is this game's music? I really enjoyed it! EDIT: also, could you upload it to spotify? I had checked the first rough version, and this is improved very well since Green Tea Latte. The Phone Apps which detailed on the customers' profile, a room for alluring BGM selection, and smoother platform graphic with the return of previous couple in Green Tea Latte are all so delightful. I hope the recipe details could be more advanced (I recall that I found zero description in one kind of the drinks, whether it's Hot Chocolate or Cappucino or other Latte drinks) and it will be kind to add more drinks variations at least like what the prototype one had. "Regardless of the setting’s appeal to players, it should be noted that Coffee Talk’s careful combination of bean-brewing and chillhop tracks are gratifying enough to stand on their own." Took a peek at this on my stream. Wound up cutting it short since it's not the sort of thing I can stream, but man is it the kind of vibe I want to live in. I just wanna hang in that coffee shop, honestly. This game is relaxing and has a great storyline about the characters and the city. Not to mention, you can make coffee, lattes, or hot chocolate for the customers while listening to their problems. I would definitely play this game when it’s relwased on Steam. 10 / 10! I find this extremely relaxing, made a let's play on it. Looking forward to more content like this! A very relaxing and chill game. Love the music and the environment and also the conversations, but I would like the game to have decision making so the player is a bit more involved. Best thing is this game is ambience: music + visuals + text combination is great. I would add longer music pieces tho. Looking forward for the full release. Congrats. I love this game, really, just a chill visual novel; the music is great, the idea of the bar is awesome, i love the graphic of the game! Sorry for being a bother, but I am trying to play the game and it seems the mouse cursor is invisible to me. Any kind of solution for this problem? Thanks for the Chinese localization. Nice translation. In China we mostly use Alipay and Wechat in online payment, so please consider about adding them into the supporting ways. Love this urban fantasy setting, great game to just sit back and cruise through the story. 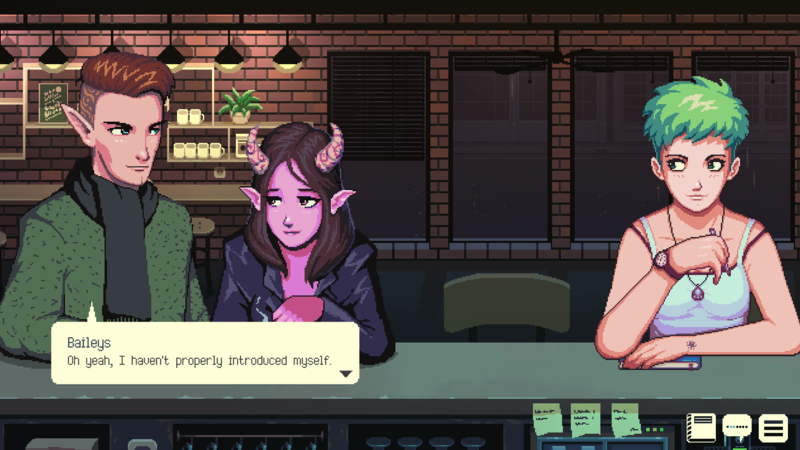 Very excited to see this game develop-- and as a side note, if I were to add anything, I'd prefer a little tutorial for making drinks on the first time 'round-- I think that'd be really handy. We're working on it now, although you will only see it in the full release version. Any plans on releasing the soundtrack? I really enjoyed this game a lot! and i look forward to playing it fully when it come out! Here the lets play i did about it! eps 2 coming soon! We just uploaded a new build with bugs fixes and Chinese localization. The Steam page says it'll be available "sometimes" next year. Unless you mean the game will periodically be taken down and then brought back throughout the year I think you meant "sometime" instead. This was a cool game so far! Great job! It is really chill to play with a great premise! The writing, art style, and music all fit together nicely. Are you considering adding an option to just mix different combinations? I enjoy the story so far, just curious! By the way good luck with the rest of the game. The brewing mechanic will probably be not too different from the demo once the game is out. As a barista myself, I was immediately drawn to this, like "I do this for work! I should be good at this! :D" And I'm basically in love with everything VA-11 HALL-A is, so that helped too. Once I got the feel for the how the drink system works, making the actual drinks was a piece of cake, and it felt so awesome when I would get it right on the first try. The music is superb on its own, but I really feel like the ambient rain sounds were what gave it that chill coffee shop vibe. It'd be cool if the characters' facial expressions were more varied, specifically to show when things are tense or someone is upset. It was strange reading text that conveyed a disagreement yet the faces of those disagreeing were soft half-smiles. On that note though, I adored Freya's little head droop, and the art itself is gorgeous. Woah, getting an approval from a barista is such an honour for us! You know its science fiction if there is an editor wanting short stories. 1. Small animation errors? Lua seems to gain then loose detail when she looks side to side? 2. Drinks. Please let the drink page of the phone have the info. It's annoying trying to find out if the drink you made IS what was ordered or is sliiiiightly off the mark. Finding it in the first place is also a tad annoying to someone with zero knowledge of coffee. Anyways, yes, I loved this. I loved all of it. The aesthetic, the dialogue, everythiiiiiiing. It's VA-11 HALL-A's chill little sister and it's so good. I'm already tossing my wallet at the screen. I cannot wait for you guys to release the full game. The potential of your game is just amazing. I have already written in my recommendation article that I can very well imagine that it (in the form of a full version release in the future) could stand in a line together with "The Red Strings Club" and "VA-11 Hall-A". It just has the same vibe. <3 Nevertheless, I would like to emphasize once again what makes this game so special in my opinion: It leaves players the time and peace to discover the entire world scenario through the narrated stories. If an order is a little off the mark, then it is not a big problem, what needs to be corrected later. And so, at my own pace, I can discover all the details that flow into the stories. That's just fantastic! And I do not even want to start to talk about the terrific pixel art, because then I could not stop anymore. <3 (Freya's grinning animation is so well done!) A real little masterpiece, thanks for that! I hope that the playthrough video we uploaded may send even more players and interested people to you. :) I will keep an eye on the project in any case! Thank you so much for the kind words and support Sebastian! Hello! I just started and love it so far! I feel a bit lost with trying to figure out how to get the right combo for what the customers want; but my main wonder is-- I saved my file, but I could not load it when I started the game back up? EDIT: Ah, I realized why I couldn't load the next day. I can't wait for the finished game-- you have me hooked with the story telling aspect and the art as well. The only thing I dislike so far is that the player character is coded Male. Once completed, are there plans for the player to potentially choose their pronouns? For the save system, it's pretty silly but we forgot to hide them for the demo. The feature will only be available on the full version. As for the barista's gender, there are some remnants of the early writing we haven't change and also the fact I'm not used to write gender neutral character in English. But having options or simply make the character gender neutral is what we're aiming for, hopefully we can pull that off nicely. You have created a superb and charming game with a mood so soothing and loose, it can be played just to relieve stress. It also depicts an intriguing racial narrative that can easily be compared to our society in this day and age. The dialogue is also well-written, it is no masterpiece but it keeps me entertained. I only have a single thing to say to you lot... You are all evil. You are wicked, do you wanna know why? I really liked this demo. Who doesn't like rainy nights? Incredible polished in clean game, considered it was a game jam entry. Is it okay to stream this game? I'm a random nobody, I was only curious, in case some friends wanted to check it out while I was playing. Stream away, share it with your friends, any support is appreciated. OKi doki. figured I'd ask, just to be sure and polite. So unfortunately when i tried to stream it, the game crashed. i'm not entirely sure why lol. it worked fine before, and then i turned it off and set it up to stream, and i got as far as the choose your name and the game crashed. and now it just refuses to go past the unity logo without it crashing. Ouch! DId you do anything different then you're previous playthrough? What's the graphic card and the drivers you're using? I didnt play through the entire 1st night. I basically stopped once i figured out the basics and then set up to stream. Driver wise I'm just using whatever the latest GeForce drive is. version 398.36 of the game ready driver. Dunno if thats helpful, i'm not the best with the more in depth computer stuff. When i set it up to stream all i did was spend a couple minutes fiddling with the audio until it sounded right and then hit new game, got to naming my character and hitting confirm. After that... crash. and after every other time i've booted it up, both on its own and in the Itch.io app has been the unity logo, and then the window goes black, then it basically goes to not responding and it goes kaput. i've tried various options, changing the Resolution, changing to window'd mode. the only thing i can say I really changed between the 2 playthroughs is that I unplugged my ps4 pad from the computer after seeing that it was interfering with the game controls.